Arrange six ¾-cup custard cups in a baking pan. No custard cups or ramekins? No panic! You can use drinking glasses, as glass only cracks when exposed to an extreme unevenness in temp. Teacups also work, so you have no excuses not to make this fantastic dessert! In the heaviest bottomed saucepan you have, melt a cup of sugar over high heat, stirring occasionally with a long heatproof spoon. Note! If you do not have a good-quality heavy-bottomed pan, then it might be best to lower the heat a bit to medium. Melting the sugar and letting it caramelize might take a little longer, but you’ll run less risk of burning it. When the sugar is all melty and a nice brown color (not dark brown! ), remove from heat by transferring the pot to a cool burner. Cool the caramel, to halt the cooking process, with a squeeze of lime (but stand back a little, it may splatter). Allow caramel to cool until less viscous and more sticky, to make your spun-caramel designs. Simply dip a spoon into the warm caramel and swirl the dripping spoon over a piece of wax paper, or a silpat, or any other non-stick surface. You can always gently re-heat the caramel if it cools beyond your liking. Scald the milk and cream by heating until small bubbles just appear around the edge of the pan. Mix the egg and sugar together. Pour the hot milk/cream over the egg/sugar mixture and stir. What else would you like to add? A dash of vanilla? Some Citronge or grated orange zest? Amaretto? The choice is yours. People have asked us about chocolate or pumpkin flans. Go, Hipcooks! To make either of these, add a few squares of bittersweet (70% or higher pure chocolate) to the milk/cream mixture and melt. Same goes for the pumpkin flan – add a few tablespoons of canned pumpkin puree to the milk/cream and season with cinnamon or allspice. Pour the mixture over the caramel and bake in a water bath at 350°F until just set, about 30 minutes (a little jiggle is good!). The flans will continue to set as they cool. Place them in the fridge to chill for at least 2 hours. To serve, run a small knife around flan to loosen. Turn over onto a plate. Shake gently to release flan, allowing caramel syrup to run all over. Top with spun caramel, how lovely! 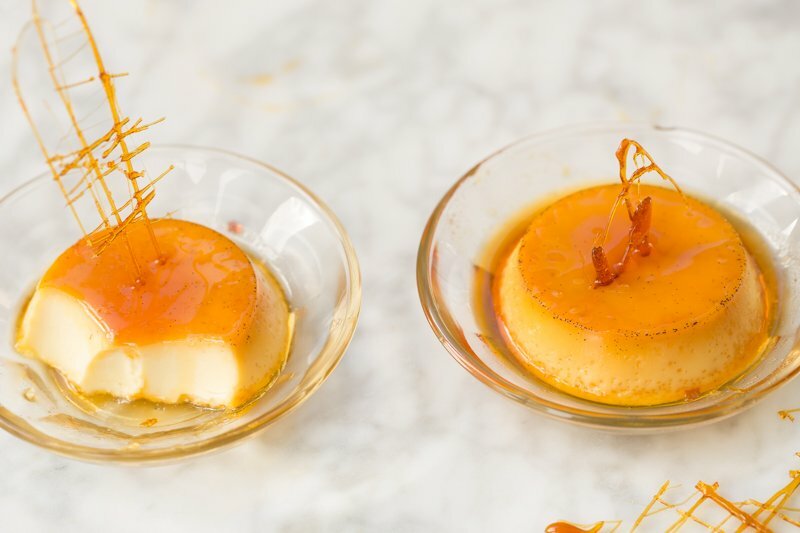 If you are having a huge Tapas party and do not want to make flans for everyone, you can make one large flan – allowing plenty of time for cooking. Alternatively, you could roll out puff pastry and line mini muffin trays with the pastry. Pour the flan filling into these and bake. When cool, you can top with pure caramel.